What happened to January and February? March 1st. Still freezing cold in Michigan, and the country as a whole I would have to say. So, in anticipation of the coming warm weather, (I mean it can’t stay like this forever, can it? CAN IT?? 😦 ) I am going to think warm and fuzzy thoughts! Complaining about the snow should qualify as an Olympic sport, and I am pretty sure I would medal out on this one! So, no more complaining for me, I promise! Looking forward to Spring, and especially Easter, I am going to brighten up my kitchen and bathroom with some warm, sunny, pastel colors. I redo my bathroom every year (small bathroom; new shower curtain and rugs, soap dispenser and trash can, a couple pictures for the wall, and a few towels to hang up and I call it good!). I feel like I am looking forward to Easter as much as I did Thanksgiving and Christmas. Easter is actually my favorite holiday of the year, yes even before St. Patrick’s Day! I am looking forward to warmer weather, flowers blooming, and birds chirping. 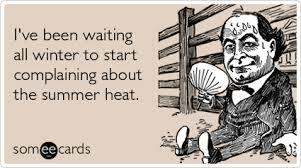 I am making a promise to myself that I will not complain one single time this year about how hot the Summer is. And they are already predicting higher than normal temps this year. Why not, right? How have you been dealing with your snow and having cabin fever? I have read so many books it is ridiculous, and my Statistics class is now officially stressing me out! I make no promises about not complaining about my college classes, but I am pretty sure if I can get through this class with a solid B (which is what I need in order for my employer to pay for this class) the rest will be smooth sailing. If I have to pay for a class that did nothing but stress and upset me: YES, I am going to be pissed! Here’s to a Happy March and warmth and sunshine on the way!